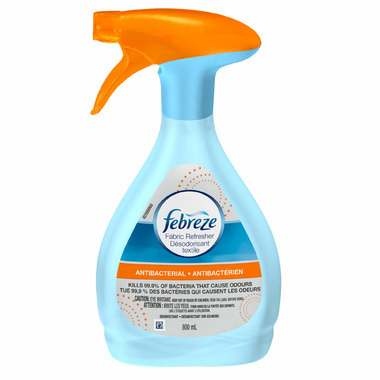 Febreze Antibacterial Fabric Refresher is a unique odour elimination formula that surrounds odours and sweeps them away, leaving your home noticeably fresh wherever you use it. Directions: To sanitize fabrics: Spot clean soiled areas before application. Spray evenly until slightly damp to eliminate 99.9% of bacteria that cause odours. As item dries, odours are eliminated and bacteria that cause odours are eliminated. To sanitize hard, non-porous surfaces: Preclean surface. Spray. Let stand 30 seconds. Wipe. On fabrics which may waterspot (such as silk), test a small area of fabric that cannot be seen. Not recommended for leather. Caution: Use only as intended. Avoid accidents. Do not spray directly toward face. May cause eye irritation. Avoid contact with eyes. First Aid: If in eyes: Hold eyes open and flush thoroughly with water for 15 minutes. If irritation persists, call a physician. This is my favourite febreze product I've tried so far. It's gotten rid of the pet smells and it's a very refreshing scent.